We’re excited that you’re interested in the 2019 Mother Lode Guide School! 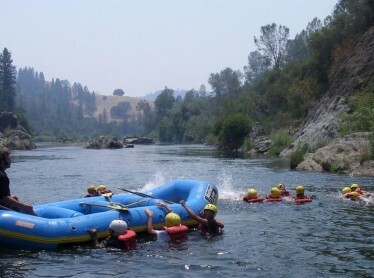 We have an amazing team of instructors and we’re located on one of the best rivers in California. We’re sure you have lots of questions, so let’s start answering them. SHOULD I ATTEND GUIDE SCHOOL? Guide School is a peak experience whether you want to be a commercial guide, or simply want to hone your skills as a private boater. So YES, you should attend Guide School! WHAT ARE THE OPTIONS IN 2019? The Spring weekend option: March 23, 24; 30, 31; April 6, 7. The earlier start allows students to work more of the commercial rafting season. It also helps meet the needs of those who work weekdays. The Summer option: June 17 – 21 A more time efficient, concentrated experience timed after the end of the school year for the convenience of students. HOW MUCH DOES GUIDE SCHOOL COST? IS THAT A GOOD DEAL? WHAT AM I GETTING FOR MY MONEY? Total retail value of Guide School is $1450—you are saving over $800 if you simply rafted, camped and enjoyed meals with us. We love sharing our knowledge of rivers with you and this is part of our investment in your success. You can sign up for guide school by filling out our general employment from and selecting “guide school”. For more information call (530) 626-4187 or email brando@malode.com for more information. HOW LIKELY IS IT TO GET HIRED AS A GUIDE? Last season 50% of our graduates worked commercially and 33% were hired by our company. This is an exceptionally high percentage in the rafting industry. It is made even more exceptional because some of our students never intended to be commercial guides and took the school for other reasons. This reflects the quality of our students and effectiveness of our training program. Our social media reviews consistently rave about our guides. You will be joining a great team! WHAT COMES AFTER GUIDE SCHOOL? At the completion of guide school some students who are interested in becoming commercial guides will be selected to continue their training. This is the process of “checking off” during which you will guide commercial passengers under the supervision of an experienced guide. Once this process is successfully completed, you are eligible to be hired as a commercial guide and become an employee who is scheduled to do commercial trips. Mother Lode is unique in that we are not only a rafting company, but also a Challenge Ropes and Outdoor Education Program. Having skills in these other areas not only makes it more likely to be selected for guide training, it gives some folks a way of earning money before they “check off” as a guide. CAN YOU GIVE US A TASTE OF THE SPECIAL SAUCE THAT MAKES MOTHER LODE STAND OUT? We keep our guide school classes small (usually 12 students), maintaining a high 4:1 student to instructor ratio. This means that you’ll get more time guiding and better personal instruction from our teachers. This is critical to a successful learning experience. Our instructors have been lauded for their vast knowledge, accessibility, and ability to create a fun environment to learn in. Many instructors have over a decade of experience rafting all over the world. They will be challenging and encouraging you through various tasks that you will be pushed to accomplish both together and individually, creating the perfect soup from which guides will emerge. Lastly, Mother Lode has exceptionally high safety standards and was the first company (back in 1982) to incorporate River Rescue Certification (RRC) with Rescue 3 as a requirement for all our commercial guides. We find that completing this training prior to guide school accelerates your learning curve and we recommend Sierra Rescue as an excellent source of this training. As the California and Western Regional Training Center for Rescue 3 International, Sierra Rescue has over 25 years of experience providing NFPA compliant classes for Fire Departments, Search and Rescue Swiftwater Teams, USAF, US Coast Guard Swiftwater Teams, Sheriff Departments and many other agencies. They are the premier provider of river rescue courses specifically designed for swiftwater professionals and private boaters. Check them out on the web at www.sierrarescue.com or call 1 (800) 208-2723 to talk with their staff directly. I’M EXCITED ABOUT GUIDE SCHOOL! HOW DO I SIGN UP? We’re excited too! All you have to do to sign up is give us a call at (530) 626-4187. Our office staff, headed up by Penny, can also answer any other questions that you may have. You can also email our manager directly at brando@malode.com with questions. We don’t want anything to keep you from achieving your whitewater dreams! “I was also very impressed on how they handled the different ages, levels, and career aspirations of the class. There were youngsters with little rafting experience who wanted eventual summer jobs and old guys like me with rafting experience looking for a bit more adventure. In each case, they tailored the training to ensure needs were met.” -Croc M.
Students learn how to pull themselves back into the raft - not an easy feat! You! Many of the students who have attended our school did so with the intent to become professional river guides. First year guides that we do hire are generally graduates of our guide school. We’ve also had plenty of folks who took the school to become better private boaters, or because it was an inexpensive way to go rafting for a week! 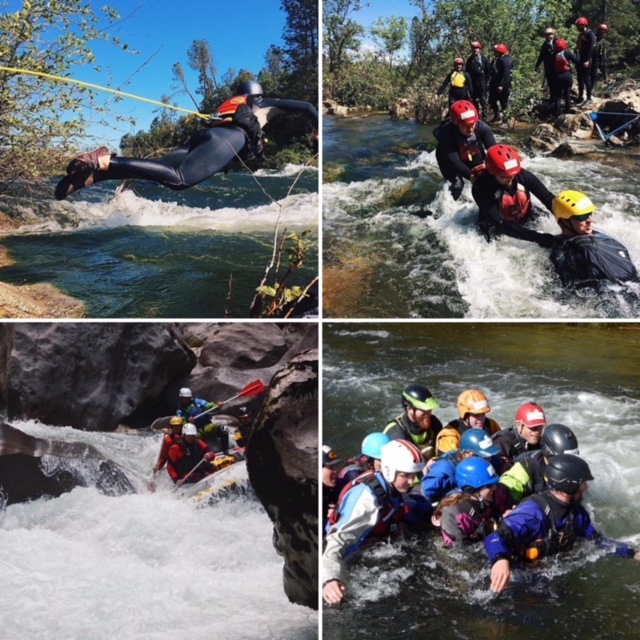 If you are a Guide School student interested in summer employment, Mother Lode River Center requires the following certifications in addition to completion of Guide School: First Aid/CPR ; River Rescue Certificate through Rescue 3.